Permian and other shale play economics and productivity may have peaked. 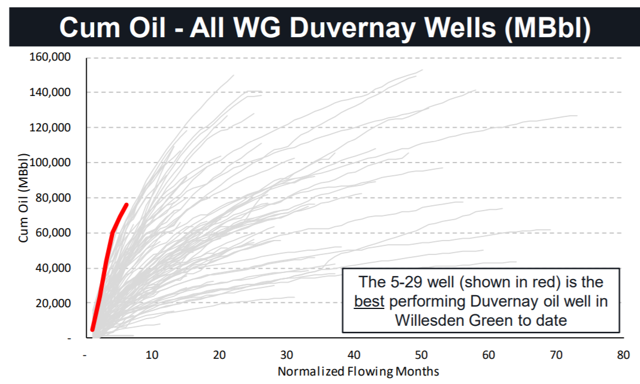 The East Duvernay is seeing rapid production growth. Well economics are competitive with the Permian. As issues pile up in the Permian and as Permian focused E&Ps see under performing share prices and peaking well productivity, another shale play is emerging to contest best-on-the-continent growth and economics. While several have shown promise, one has seen incredible productivity increases and 100%+ annual production growth while flying under the radar: the East Duvernay. The above production chart from BMO shows an astonishing 1000% production growth from the start of 2016. This play has remained mostly un-discussed and undiscovered because it has been led by two excellent private operators: Vesta and Artis (backed by private equity firms Warburg Pincus, Riverstone, and JOG). However, public companies such as Baytex (BTE), Paramount (OTCPK:PRMRF), Journey (OTC:JRNGF), Crescent Point (CPG) and Repsol (OTCQX:REPYF) are ramping up their activity in the play. As can be seen, BMO sees oil price break-evens competitive with the Midland and Delaware basins in the Permian, and IRRs as good as or better than the Permian, and much stronger than the DJ and Eagle Ford. These are supported by strong well productivity and low royalty rates. 80,000 barrels of oil cumulative production in ~7 months is compelling, particularly with a 5% crown royalty on it. 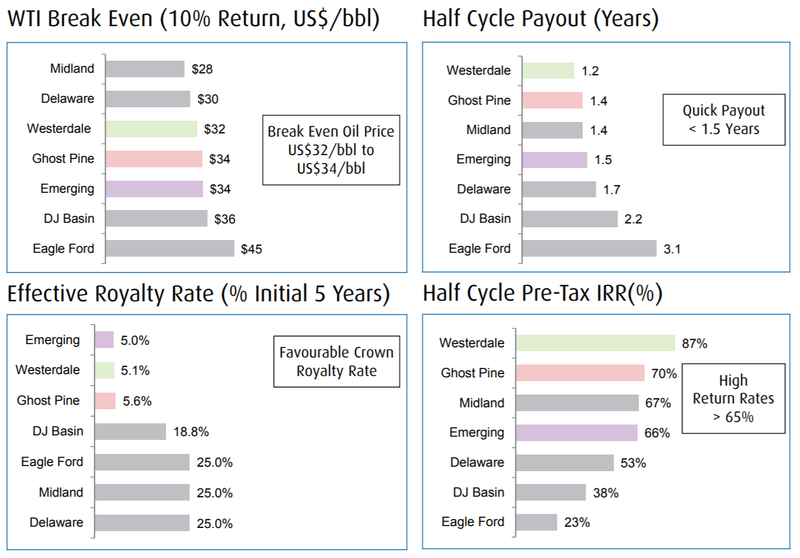 Prairie Sky (OTC:PREKF) owns some mineral rights in the area with higher royalties, but even on a blended Prairie Sky / Crown basis, the royalties are much lower than in the US and returns are compelling. With estimates of 60+ billion barrels of oil in place, improving well productivity, and compelling well economics, the size of the prize is enormous. However, with their public equity market valuations so depressed, showing a valuation per acre chart similar to what I had shown in articles on Permian producers is less illustrative because the public companies trade near or below the PDP value of their reserves, implying 0 value for their E Duvernay or other upside exposure. It should not be a surprise that the East Duvernay has attracted private equity capital from leading funds such as Warburg Pincus, Riverstone and JOG. And most recently, Arc Financial just made a large investment in the area through Kiwetinohk, led by Seven Generations (OTC:SVRGF) founder Pat Carlson, which has joint ventured with Journey. At the recent growth rate, it won't take long for this play to become much more prominent. As awareness of the play increases and production grows, valuations could rise as well. Disclosure: I am/we are long JRNGF, CPG. I wrote this article myself, and it expresses my own opinions. I am not receiving compensation for it (other than from Seeking Alpha). I have no business relationship with any company whose stock is mentioned in this article. Additional disclosure: Disclaimer: Opinions expressed herein by the author are not an investment recommendation and are not meant to be relied upon in investment decisions. The author is not acting in an investment adviser capacity. This is not an investment research report. The author's opinions expressed herein address only select aspects of potential investment in securities of the companies mentioned and cannot be a substitute for comprehensive investment analysis. Any analysis presented herein is illustrative in nature, limited in scope, based on an incomplete set of information, and has limitations to its accuracy. The author recommends that potential and existing investors conduct thorough investment research of their own, including detailed review of the companies' SEC filings, and consult a qualified investment adviser. The information upon which this material is based was obtained from sources believed to be reliable, but has not been independently verified. Therefore, the author cannot guarantee its accuracy. Any opinions or estimates constitute the author's best judgment as of the date of publication, and are subject to change without notice.